Need to Vent! — Movie Reviews with a Twist: WHAT'S IN A NAME? Being a semi-proud graduate of New Braunfels High School I have long had an interest in the nicknames chosen by this nation's cadre of both private and public educational institutions. After all, what would one expect from a Unicorn? To be more precise -- a New Braunfels High School Fightin' Unicorn? Texas has many other perplexing team names -- the Hutto Hippos and the Port Lavaca Sand Crabs are just two that spring to mind. Alas, the undisputed all-time winner, however, hails from a private high school in Pittsburgh, Pennsylvania -- the BISHOP BOYLE LANCERS! Unfortunately, this school is no longer in existence according to Darren Lohr who sent me the license plate photo. 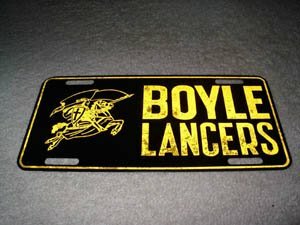 Yes, ladies and gentlemen, the Boyle Lancers -- a nickname that sits atop the annals of high school sports trivia.